It's September 1944 and fifth grader Billie Packer is anxiously awaiting her big brother Leo's visit, the first one since he joined the Marines. There's so much she wants to talk to him about, like how to get Hazel to be her best friend again. But when Leo arrives, much to Billie's disappointment, he isn't alone, he's brought his buddy Denny, a Navaho, and an injured dog they found near the highway. It doesn't take long for Billie to get friendly with Denny, and to fall the dog, that Denny had named Bear. Before Denny leaves, he tells Billie that he thinks Bear's purpose is to help her find what she is looking for. Soon, Leo ships out to the Pacific, Denny is recruited as a Navaho code talker, and Billie's life settles into a routine of school, chores, taking care of Bear, and hanging out with Tito, a Mexican boy in her class. Although Billie has been bullied by two boys in her class, their real target is Tito. When the bullying gets ugly and something happens to Tito, Billie finally realizes what she has been looking for, thanks to Bear. And thanks to Bear, in the middle of a battle, Denny also learns what is important to him. Readers who have read any or all of the previous Dogs of War series, which includes Duke, Dash, and Liberty, will surely enjoy Code Name Courage. Readers new to this series will find that their is so much to learn about the home front in these novels. They are all so well-written, well-researched, and historically accurate. 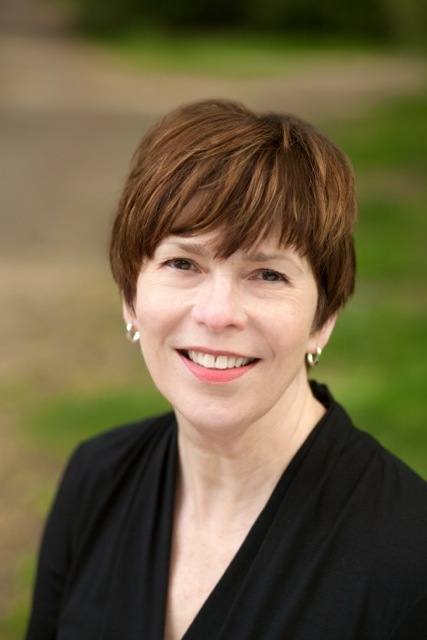 In the following interview, I asked Kirby Larson about her research, what inspires her and what she hopes readers will get from her books. Though I have always loved reading and writing, I never knew writing was a career option until college; and then, it was journalism, which became my major. Were you always partial to historical fiction? Why? When my daughter was in 6th grade, she introduced me to the historical fiction of Karen Cushman (Catherine, Called Birdy) and Jennifer Armstrong (the Mary Meahan series). I fell in love with those books, wishing such rich treatments of history had been available when I was a kid. It wasn’t until I heard a snippet of my own family history, however, that I was drawn to writing historical fiction. That first foray turned out to be Hattie Big Sky and I haven’t looked back since. Can you tell us something about your research process for your historical fiction novels? Oh dear. What don’t I do during the research process?! I read every single first- hand account/primary document I can get my hands on, including recipes! I interview experts, and those who have lived through the time periods/experiences I’m writing about. For example, for Dash, I spoke to women who had been incarcerated in war relocation camps during WWII. And for my latest book, Code Word Courage, I read every Navajo Code Talker memoir published. I also interviewed a Code Talker, as well as the son of a Code Talker. I read old newspapers, read books published during the time periods I’m writing about, collect old maps, train timetables – you name it. I do whatever I need to do to feel confident I can recreate a slice of the past for today’s young readers. 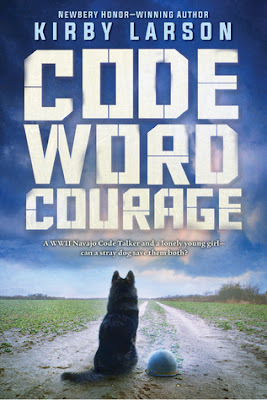 I wonder, what were some interesting or surprising things you discovered during the research process for Code Word Courage and the other Dogs of War novels? There are so many surprises – I’ll share a few. I was astonished to realize that normal American families loaned their pets to Uncle Sam during WWII (Duke); I was amazed to learn that, despite being sent to horrible, barren places, the incarcerees of Japanese descent created beauty with scraps of lumber, or found shells or greasewood branches (Dash); I was astonished and humbled to discover that 400 Navajo men helped to create a code based on the language they once had been punished for speaking (Code Word Courage). Each of the Dogs of War stories feature a triangular relationship between a young person, their dog, and an older person. What inspired you decide to write a series of WWII stories where a dog is the catalyst for the strong bond that develops between the three of them? The honest truth is that the first book written, Dash, (the second book published) was inspired by the love of one person for her dog. Once I had written that story, inspired by Mitsi Shiraishi, I knew each of the stories that followed would also involve a dog. It was one of those serendipitous gifts that writing can bestow. In Code Word Courage, you tell both Billie and Denny’s stories in the first person. I can understand how you could write Billie’s story but I wonder what sources did you draw upon to get into the mind and heart of a Navaho Code Talker? As I mentioned above, I read every single first-hand account, memoir, newspaper article, etc. to help me understand the factors that would have shaped the character I’m writing about. I also rely on my imagination and empathy to put myself in any character’s shoes. Though those who were part of WWII are diminishing in number, there are still a few veterans surviving. I was able to interview Dr. Roy O. Hawthorne, whose experiences as a Code Talker shaped the creation of Denny’s story. In addition, Michael Smith, son of Code Talker Samuel “Jesse” Smith Sr. read my manuscript for accuracy. I laughed when I read Hobie Hanson, the main character in Duke, wore PF Flyers (my own personal sneaker choice). All of your Dogs of War stories (in fact, all your historical fiction) have this kind of authenticity to them without overwhelming readers with too many normal, but accurate details about what life was like for kids on the home front. How do you know when you’ve included enough realistic details? And how do you decide on what to include, considering most of today’s readers may not be familiar with many of them? I am so lucky to have a terrific first reader, and a terrific editor who kindly but firmly tell me when I am shoehorning in too many of the great facts I’ve learned about a past time and place. If it were left to me, I would share EVERY fascinating detail I uncover. But then my stories would read like history books and that’s not what I’m trying to create. As for deciding what to include, I have tremendous respect for my readers who, even if they might not understand every detail in a book, are smart enough to figure out the essence of each story. What do you hope today’s readers will take away from your WWII stories? One of my goals as a writer is to leave room for my readers to take away from each story what they need to take away. That being said, I wouldn’t be disappointed if my readers felt inspired to be kinder and more tolerant after reading one of my books. I have really enjoyed reading all four of the Dogs of War stories. Will there be any more Dogs of War books? I have learned never to say never but, at this point, I am ready to step away from WWII for a time. I am working on a novel with a slightly older main character (16) set in pre-crash 1929. After that, who knows?! One last question - do you have a favorite dog story not written by Kirby Larson? Oh my goodness. Must I choose only one??? I can’t, so, here are a few: Love that Dog (Sharon Creech); How to Steal a Dog, and Wish (Barbara O’Connor); and Because of Winn-Dixie (Kate Di Camillo). Books about dogs I haven’t yet read but are on my nightstand: Chasing Augustus (Kimberly Newton Fusco); Good Dog (Dan Gemeinhart) and Following Baxter (Barbara Kerley). Thank you so much for this opportunity to talk about my passion – writing historical fiction for young readers. I am grateful for your interest. 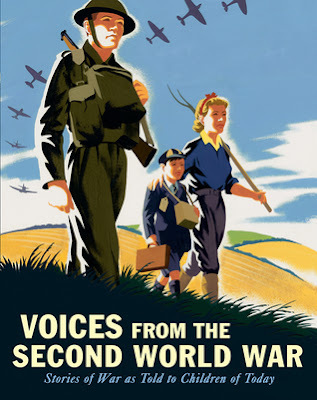 I mentioned in my review of Voices from the Second World War that writer/artist Shirley Hughes was one of the people who contributed her wartime experiences to that excellent collection of oral histories, and that she had also written a book based on them (see Whistling in the Dark). 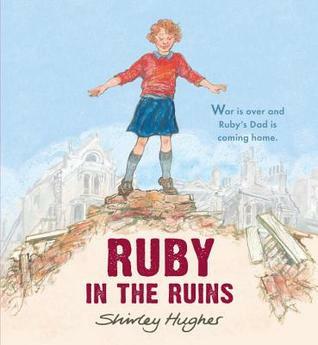 Ruby in the Ruins is Hughes' latest picture book, one that takes place just at the end of WWII. 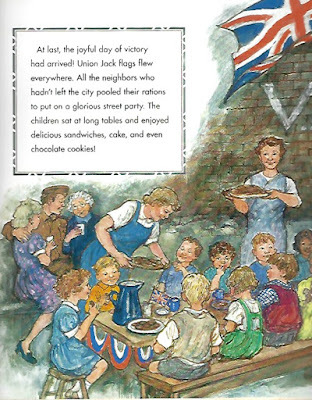 Everyone in Ruby's London neighborhood is celebrating the end of the war with block parties, including Ruby and her Mum. But, though the fighting may have ended, the memory of the Blitz is still fresh in their minds. There were all those nights when the air raid sirens went off, and people were supposed to go to their nearest shelter. And kids had been sent out of London for safety, but Ruby and her Mum stayed - just in case her dad, who is in the army, got leave and could come home to visit for a visit. Those scary days and nights may be in the past, but all around her, Ruby sees houses had been bombed and blackened, and now they were fenced off piles of rubble that need to be cleared up. And while Ruby's friends have already welcomed their dads home from the war, she and her mum have to wait a long time for her dad. When Ruby's dad finally does come home, Mum welcomes him with open arms, but Ruby doesn't know what to say to him. And besides that, now everything has changed. Ruby sleeps in the small attic room instead of with Mum, and has forgotten that her tall dad takes up lots of space. Not only that, but she continues to feel rather shy around him. But when her Mum allows Ruby to go off with two neighbor boys that she knows, they decide to explore the fenced off ruins of some bombed out buildings. When an accident happens, it proves to be just the catalyst that helps Ruby overcome her resentment and shyness towards her dad. The detailed illustrations are done in ink, watercolor, and gouache, and, because Hughes has drawn them from her own memory of the war, have a real air of authenticity about them. The bombing damage to London's buildings was extensive and the fascination of playing in the rubble must have been irresistible for kids at that time, just as Hughes depicts, but also dangerous. Ruby in the Ruins is a charming story with a pleasing ending, but it never become sugary sweet. 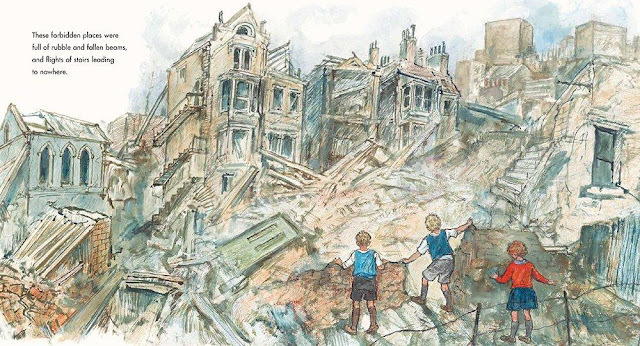 What it does do, as Shirley Hughes always does so well, it look at the end of the war from the point of view of a child who world suddenly changes. The war is over, its no longer just Ruby and her Mum, and she experiences an expectable awkwardness when her Dad returns after being has been gone for such a long period of time. Post war picture books are in short supply, and I can't recommend this one enough. When I was in college, I discovered a book by Studs Terkel called The Good War: An Oral History of World War Two. Terkel had collected the memories of a wide variety of people, providing a good overview of how each interviewee was impacted by the war. If you haven't read The Good War yet, I highly recommend it. Oral histories have always fascinated me, so when I heard about Voices from the Second World War, I was pretty excited to see what it was all about. It turned out to be a unique collection of short, first person recollections (most are only 1-2 pages, some longer) told to some of today's young people, and though the book is basically Britain-centered, there is still plenty included for all children to appreciate. The book is organized into 16 sections that follow the course of the war from outbreak to the fall of Japan. Interviewees relate their experiences in the RAF, the U.S. Navy, working as a Land Girl or a code breaker, being evacuated to London in 1938 with the Kindertransport from countries being threatened by Hitler, leaving family behind and often never seeing them again, being evacuated from London to the countryside when war was declared in 1939, fighting in the Resistance, surviving the Holocaust and POW camps. Readers will also read what the navigator of the Enola Gay has to say about the bombing Hiroshima, as well as hearing from a survivor of that bombing. It is affecting and compelling to read about how different people reacted, endured, and survived the circumstances this terrible war threw at them. All of the stories are equally important, though some readers will surely recognize at least a few of the people interviewed. There is, for example, Sir Nicholas Winton, the humanitarian who saved 669 children in 1938 when he organized the Czechoslovakian Kindertransport to bring them to Britain and place them in homes where they would be safe from the Nazis (Sir Nicolas passed away shortly after being interviewed by Amélie Mitchell and Daniel McKeever. 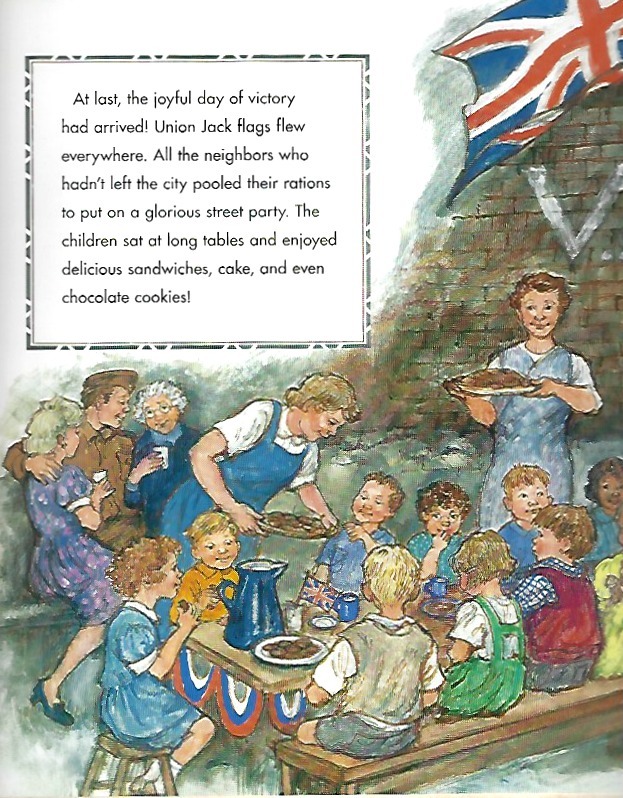 Readers may also be surprised to learn that two favorite children's authors, Shirley Hughes and Judith Kerr, both had wartime experienced. Shirley was 12 when the war started, and living near Liverpool with her mother. She told her interviewer that at times the war was very frightening, at other times, it was very boring, but she had involved herself in doing things like collecting salvage for the war effort. When the Nazis started bombing the docks in Liverpool, Shirley stayed where she was rather than be evacuated to safety. 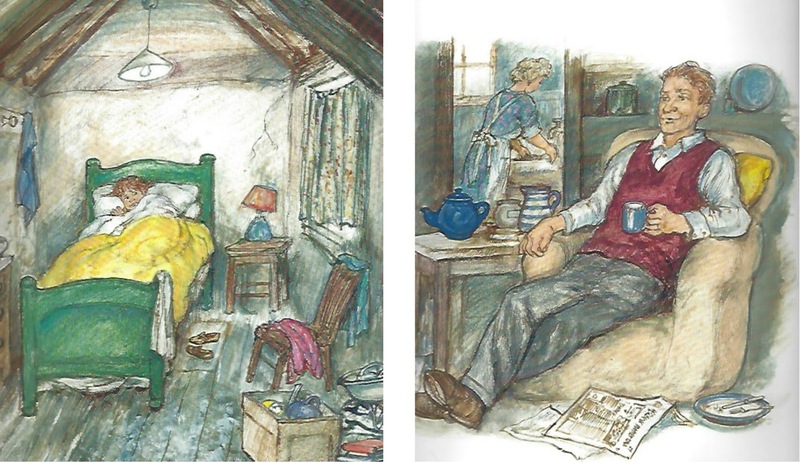 Shirley Hughes has written a few books about WWII, including Whistling in the Dark, an novel based on her own wartime experiences. Judith Kerr's experience began in Berlin almost as soon as Hitler became Chancellor of Germany. Because her family was Jewish and her father was an outspoken critic of Hitler, it soon became apparent that the family needed to leave Germany. Packing only what they could carry so that they wouldn't arouse suspicion, Judith decided to leave her beloved pink bunny behind. The family made it to Switzerland, then to London in 1936. Fans of Kerr can see where the inspiration for When Hitler Stole Pink Rabbit came from. Each memory provides the reader with a personal window into the past told by those who actually lived it. What is particularly nice is that all the memories were collected by school children, some of whom you will meet at the beginning of the book. In addition, each memory includes black and white photos, most are personal, but there are lots of photographs from the war in general. There is also an Index of Subjects, and an Index of Interviewees, as well as a useful Glossary. As more and more of the witnesses to World War II die and take their stories with them, it is important to record their memories. Fortunately, what Terkel did for adults with The Good War, these young people have done for other children with Voices from the Second World War. 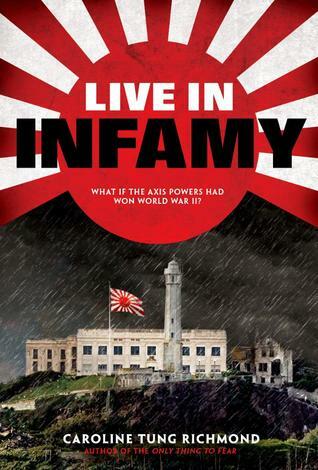 Live in Infamy continues the alternative history begun in The Only Thing to Fear. The premise of both books is simple - it's 80 years after the Allies have lost WWII, and the Axis powers have divided up the United States into three territories - the Eastern American Territory (EAT) ruled by the Nazis, the Western American Territory (WAT) ruled by Imperial Japan, and the Italian Dakotas. And like all oppressive regimes, there is a resistance movement seeking to thwart and overthrow them. The Only Thing to Fear focused on the Eastern American Territory and resistance leader Zara St. James, who is also an Anomaly. In Live in Infamy, Richmond takes the reader to the Western American Territory (WAT). where they meet Ren Cabot, a 16 year-old Chinese American whose Chinese mother was in the resistance and executed five years earlier. Since then, Ren and his father have worked together in the family's tailoring and cobbling business. A resistance movement still exists in the WAT but now essays by someone known only as the Viper are circulating and causing unrest among the people, and especially ruling Crown Prince Katsura, who wants nothing more than the catch the Viper. And no one suspects that Ren is the Viper, including his father, Paul Cabot, and cousin Marty. Paul Cabot has recently been summoned to Fort Tomogashima, also called the Fortress, to help with sewing uniforms for an upcoming Joint Prosperity Ball. But one night, Marty brings him home with a badly injured hand, and Ren discovers they are both in the resistance. It is decided that Ren will take his father's place in the Fortress, where two other resistance members are already embedded. Once inside the Fortress, the plan is to kidnap the Crown Prince's daughter, Aiko, during the ball, and take her to Alcatraz. Marty has intel that there are prisoners being held there, and when Ren learns his mother might be one of them, the mission becomes personal. But it is more than just about rescuing prisoners. Alcatraz is also being used as a laboratory for experiments with Anomalies. Before the war, the Nazis had been involved in genetic testing in their concentration camps. The result was super soldiers called Anomalies, each of whom has a particular super human ability. Used by both the EAT and the WAT, the number of Anomalies has been dwindling quickly, and need to be replaced. More testing has resulted in a genetic breakthrough called V2, a joint effort of the Empire and the Nazis. The Joint Properity Ball is a chance to deliver V2 to Alcatraz while everyone's attention of focused elsewhere. But the resistance also really wants that V2 and the fifteen remaining Anomalies in Alcatraz. At the Fortress, Ren also discovers that the Viper's essay's against the Empire are a focus of the Crown Prince's anger, so much so that he is willing to, and does, execute anyone caught with a copy of an essay - and copies are circulating widely. Marty and the resistance have come up with a wild, convoluted plan, but if the mission fails, Ren's cover could easily be blown. Live in Infamy is not just a dramatic companion to The Only Thing to Fear, it is also a worthy one, and I think Richmond has really honed her writing chops for this second novel. She has included just enough twists and turns to make the story interesting, exciting, and suspenseful but not so much that the reader has trouble following the plot - and the best part is that it is a stand alone novel. Which means that if you missed reading The Only Thing to Fear, that's OK, although you might want to read it as well. I thought Ren was a nicely developed character, one whose anger at the injustice and treatment of racially different and racially mixed people is totally justified. Other characters, like Marty, Mr. Cabot, and even Greta Plank, who plays a large part in Ren's time within the Fortress, aren't quite as developed as I would have liked them to be given their roles in the story's plot, but I don't think that diminishes the overall enjoyment of the novel. I should also mention that there are some violent scenes so this book may not appeal to more sensitive readers. I personally found reading Live in Infamy an intriguing alternative history of WWII, particularly at this moment in time. Richmond tackles race and biracial themes as well as political persecution, and the role of the resistance. These are themes readers find in books about WWII, but they are also once again coming to the surface in today's world, so although this is an alternative history, it will no doubt resonate with today's readers. It's February 1942, almost two months since the bombing of Pearl Harbor and Nanea Mitchell, 9, is getting ready to go back to school. But school won't be the same for her and her friend Lily now that their other friend Donna has been sent back to the United States with her mother. And then, she finds a new girl sitting in Donna's seat at school. To make matters worse, the new girl, Dixie Morena, is given the important job of class War Stamps monitor, a job Nanea thought she should have been given. It's a job that involves the weekly sale of war stamps to the kids in the class, with the hope of winning a coveted Minuteman Flag if they buy enough stamps. Nanea tries to be friendly, but Dixie doesn't seem interested, in fact, she seems bored - always yawning and putting her head on her desk. But after an incident that finds both girls in the principal's office, Nanea, Lily, and Dixie finally become friends. Nanea is also worried that her older brother David will enlist as soon as he turns 18 in May. David does a lot of volunteer work for Lieutenant Gregory, but wants to do more for the war effort. Older sister Mary Lou, 15, also does volunteer work for the war, and is never without her knitting, making needed items for soldiers. her age. Volunteers would do things like collecting bottles, babysitting so mothers could take first-aid classes, working in Victory Gardens, baking cookies, serving meals, and maybe even helping out in hospitals. But despite school, friends, and the Honolulu Helpers, Nanea still worries about her brother, the night time air raid drills, and the possibility of losing her beloved dog Mele again. She is so afraid of losing Mele, that Nanea keeps her close by except during school. One day, as she is playing some records in her room, Nanea notices that Mele is moving to the music. Naturally, Nanea decides to teach her to hula, which, thanks to some tasty cookies, Mele picks up quite quickly. Later, at the USO show, the soldiers is so entertained by her hula dancing dog, that Nanea comes up with an idea of how to bring Mele to the soldiers in the hospital, who couldn't come to the show. But how to do that if dogs and kids aren't allowed in hospitals? Nanea enlists the help of Lieutenant Gregory, maybe he can convince the hospital to find a way. Meanwhile, Nanea's class is falling behind with war stamp purchases, and it looks like there will be no Minuteman flag for them. But their teacher, Miss Smith, has a surprise guest come in a give them a pep talk. Will that help? When you read an American Girl story, it's a safe bet that nothing too awful or scary is going to happen. They essentially present the life of a 9 year-old girl during a period of change and focus on how main character adjusts to those changes. There is lots of historical information introduced along the way, and the Nanea books are no different. 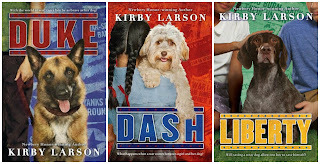 Kirby Larson, who has had plenty of experience researching and writing historical fiction for young readers, has written the first two books, Growing Up with Aloha and this one. 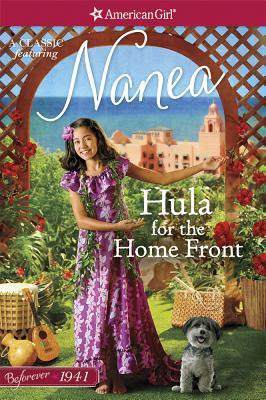 I thought Hula on the Home Front was a well written work, that easily carried over from the first book and increased our understanding of what it was like being a 9 year-old at that time and place. Nanea is a sweet, generous character, but like all girls at some point, she also has to deal with feelings of jealousy and learn how to gracefully accept the new girl in her life, even as she misses her old friend. But Nanea also must deal with other big changes that impact her life - her father is often away from home working double shifts, while her mother helps out at the Red Cross. Then there is rationing, blackout curtains, and the Dogs for Defense program. Would Dogs for Defense want Mele? Could Nanea part with her beloved dog? I do think it would be nice if more about Lily's family, who happen to be Japanese, were also included, especially given what was happening in the US at the time. Larson does introduce the internment of Japanese Americans on the West Coast, but doesn't really go into any detail about it. Could there be a book about Lily in the works? Nanea is a nice addition to the WWII American Girl books, though I'm sorry they won't be publishing as many different ones as they did with the original historical characters. My kids, at home and in school, really loved reading those books and most never even owned a doll. A lot of Hula on the Home Front does presuppose that the reader has read the first book where most of information about Hawaiian life and culture was given. There is still some given here, along with Hawaiian words with pronunciation and meaning found at the back of the book. Readers also do learn more about the meanings behind the movements of hula dancing, and its purpose. As always, do read the section Inside Nanea's World for more information about war stamps, clubs formed by kids and other war time efforts. Though not a nice as the earlier American Girl stories, it is still helpful. Hula on the Home Front will please AG fans, as well as those who like WWII history. This book was purchased for my personal library.